​JOURNEY OF THE HEART - (IRVINE, CA) – A celebratory tribute and dedication to the extraordinary career with works by legendary dancer, choreographer, teacher and humanitarian, Professor Donald McKayle. McKayle, unquestionably one of America’s greatest choreographers, is presented by the University of California (UCI), Irvine Dance Department at the Claire Trevor Theatre on the UCI Campus. Through McKayle’s long relationship with UCI’s Lisa Naugle, Chair at University of California, Irvine Dance Department, this celebration of masterworks will be danced by UCI Etude Ensemble. The UCI Etude Ensemble was initiated by McKayle in 1995 as outcome of his RAINBOW ETUDES, a work given to the Dance Community of the world as a gift. It is an outlet for UCI dancers to experience the creation of new works and performing. Auditions are held yearly for this class and all students receive credit for participating and performing in the Ensemble. McKayle, has spent his entire life devoted to his art with works that have reached into nearly every topic in the human experience numbering over 250 and span 65 years. He has for his entire career been in the forefront as a major leader in dance and all entertainment media. For the past 27 years, McKayle has created works on the UCI Etude Ensemble bringing dance education to new heights in training with every new creation. Dancers from across the United States and throughout the world have rallied and competed for positions to work with McKayle, “one of America’s Irreplaceable Dance Treasures: the first 100.” Consistent with McKayle’s multicultural world view and global affairs that affect all people, three distinct works of great significance make this program unique. They reflect McKayle’s uncanny ability to connect with his environment. McKayle forever a humanitarian, concerns us with the folklore of America’s indigenous people, the plight of the current immigrant situation worldwide and the joy’s that life offers. DEATH AND EROS is the initial entry in Donald McKayle’s “Story Dance Theatre” evening. The Lula Washington Dance Theatre premiered it on February 11, 2000. The work is immersed in the lore of indigenous peoples. The dance is a movement illumination of the legend of the “Skeleton Woman,” an Inuit tale passed down in the oral tradition from generation to generation. A father casts his daughter into the sea for committing an act of unforgivable effrontery to communal mores and sacred beliefs. Beneath the waters her flesh is eaten away leaving only her bare skeleton and her spirit that remains alive. A hungry fisherman, far away from his home, comes to the cove of the Skeleton Woman, a place believed hunted by the local fisherman and therefore avoided. The fisherman get lost in a great storm and arrives in the forbidden cove, casts his line into the waters. He hooks the skeleton woman tossing in the currents below and pulls her upward to his kayak. He retreats in fear from the horrific sight that he beholds, dragging the caught skeleton woman with him. In a macabre dance, she seems to trip across the surface of the water. He reaches land and races across the frozen tundra; with the skeleton woman latched to him, in a constant pursuit. He reaches his hut and dives inside in the darkness. Trembling with hunger and fear, he lights a fire. In the flickering glow of the flames, he perceives the skeleton woman lying in an entangled heap. In this vulnerable state, she is no longer frightening or dangerous. Something is awakened within him; he approaches her, rearranges her bones, and decides to bury her properly the next morning. As he sleeps tears seep from his eyes. The skeleton woman crawls over to him and drinks the salty liquid. Flesh returns to her bones and hair grows lushly upon her head. She awakens the sleeping fisherman, pounding his heart like a drum with a sacred and lustful rhythm to awaken her own heart. They join together in a communion of body and spirit. Whenever the northern lights are seen, they are there, ever present as two piercing dots of light within the Aurora Borealis. Their love is eternal and stronger than death. JOURNEY OF THE HEART, Donald McKayle shows emotional and evocative dances that reveal the heart of humanity. For this setting, he has taken a selection of dances from his HEARTBEATS, a work that had its premiere on February 14, 1997 with the José Limón Dance Company in San Jose, California. 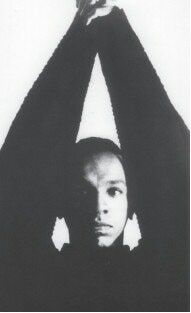 For JOURNEY OF THE HEART, McKayle chose dances that celebrate through their movements; songs that flow from the deep regions of the heart; that sing eternal lyrics; songs that cross the boundaries of language and culture; songs that, whether vernacular of noble, resonate with the rawness and veracity of universal human emotions. It can be viewed as a Journey of the world. Donald McKayle has also selected dances for JOURNEY OF THE HEART from his earlier work, SONGS OF THE DISINHERITED which, are some of McKayle’s heritage masterworks. It examines and speaks deeply of varied aspects of the Black Diaspora in the New World. SONGS OF THE DISINHERITED was choreographed in 1972 for the Inner City Repertory Company of Los Angeles and since then has entered the repertories of the Lula Washington Dance Theatre and the Cleo Parker Robinson Dance Ensemble among others. The solo Angelitos Negros has been performed by Elizabeth Roxas of the Alvin Ailey American Dance Theater, Roxane D’Orleans Juste of the José Limón Dance Company, Melissa Young and Nycole Merritt of Dallas Black Dance Theatre, and is a signature performance piece for the dance soloists Stephanie Powell and Nejla Yatkin. It has also been danced by many students at UCI and is a favorite among solo women dancers.